Blues secure first win of the season!!! 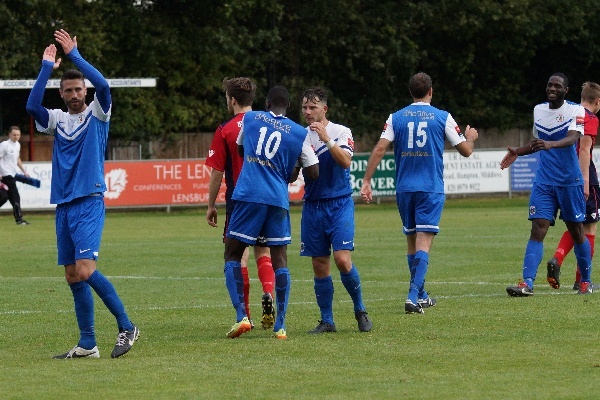 Grays Athletic enjoyed their first win of the season with a stylish 3-0 victory against Hampton and Richmond at the Beveree Stadium. The game was even for the first fifteen minutes with Grays, spearheaded by Jamie Guy up front slowly finding their range. The first chances of the game came in the 12th minute, when Joao Carlos linked up well with Jay Siva but both his shots were bundled away by the Beaver's keeper. Grays looked a class apart from Hampton and so it was only fair that they went ahead in the 22nd minute when Jay Siva sent across a free kick and Jay Leader clipped home from close range. At this point, Grays fans were pleased that the team were playing like a strong Ryman Premier side. Grays enjoyed the majority of the possession but the warning signs were there that this was a fragile lead. In the 30th minute, Ben Harris, completely unmarked, had a free header from a corner but it went over. Grays continued to produce good link up play up front. In the 32nd minute, Jordan Wilson bustled into the area, passed to Joao Carlos, whose shot was well saved by Jack Norton. It was Norton that was keeping Hampton in the game. Hampton were trying to squeeze the game in midfield. The final moments of the first half were punctuated by "switch off" moments from the Grays Ath defence. Grays looked sprightly as they started the second half. Jordan Wilson had a half chance with a header. But the Beavers still threatened. A dangerous free kick in the 56th minute could have ended in a goal. Grays boss, Jody Brown was keeping his subs warming up as he looked for that second goal. The second goal did indeed come in the 65th minute after good work down the left by Joao Carlos saw his low cross deftly turned in by the talismanic Jamie Guy. Hampton did not really have any reply and the whole game gave Jody Brown's men a real chance to blend. He will have been delighted to have seen the players combine so well. The icing on the cake came in the 84th minute when Lloyd Harrington put the third goal in from close range. And the last nail came in the form of an own goal in injury time. Grays return to Mill Field to play AFC Hornchurch on Monday.